Before the Europeans came to America, it is estimated that anywhere from 1.2 million to 12 million Native Americans inhabited the land. The population of the Native Americans was reduced to 250,000, due to mass murder, genocide, imported diseases, slavery and suicide. There is no question about it, these people suffered a great tragedy. One could argue that it is the most devastating thing to ever happen to any population of people in the history of the world. Yet, little to no attention is given to this tragedy. One has to wonder, why? Not only were the Native American people killed, but much of their customs, traditions and spirituality were lost along with them. Perhaps this was another reason for the genocide? These people were truly connected and in tune with Mother Earth, often referred to as the Keepers of the Earth. "walk lightly upon the Earth and live in balance and harmony." Maybe, if more of the Native Americans were alive today the Earth wouldn’t be in as much turmoil as it is. 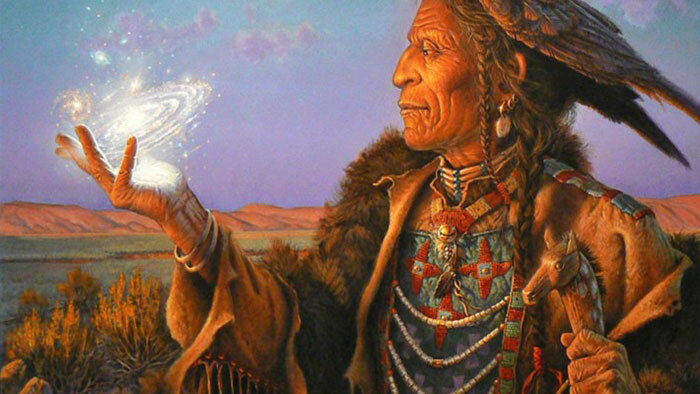 We can all benefit from adopting some of the ancient spiritual teachings from the Native American elders into our daily lives. "The Great Spirit is in all things: he is in the air we breathe. The Great Spirit is our Father, but the Earth is our Mother. She nourishes us; that which we put into the ground she returns to us." "The first piece, which is the most important, is that which comes within the souls of people when they realize their relationship, their oneness with the Universe and all its powers and when they realize that at the center of the Universe dwells the Great Spirit and that this center is really everywhere, it is within each of us." "Only when the last tree has died and the last river has been poisoned and the last fish been caught will we realize we cannot eat money." When doubt no longer exists for you then go forward with courage. "Humankind has not woven the web of life. We are but one thread within it. Whatever we do to the web, we do to ourselves. All things are bound together. All things connect." May hope forever wipe away your tears. And above all, may silence make you strong. "Before our white brothers arrived to make us civilized men, we didn’t have any kind of prison. Because of this, we had no delinquents. Without a prison, there can be no delinquents. We had no locks nor keys and therefore, among us there were no thieves. When someone was so poor that he couldn’t afford a horse, a tent, or a blanket, he would, in that case, receive it all as a gift. We were too uncivilized to give great importance to civilized property. We didn’t know any kind of money and consequently, the value of a human being was not determined by his wealth. We had no written laws laid down, no lawyers, no politicians, therefore we were not able to cheat and swindle one another. We were really in bad shape before the white men arrived and I don’t know how to explain how we were able to manage these fundamental things that (so they tell us) are so necessary for a civilized society." "Oh Great Spirit, help me always to speak the truth quietly, to listen with an open mind when others speak, and to remember the peace that may be found in silence." "Peace and happiness are available in every moment. Peace is every step. We shall walk hand in hand. There are no political solutions to spiritual problems. Remember: if the Creator put it there, it is in the right place. The soul would have no rainbow if the eyes had no tears. Tell your people that, since we were promised we should never be moved, we have been moved five times."